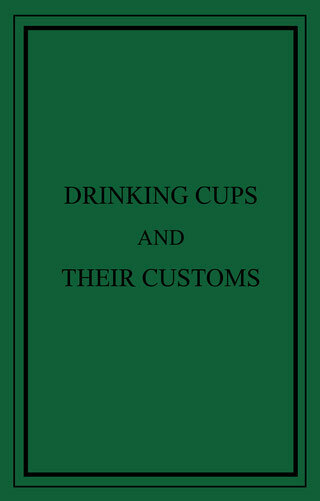 THE principal object of these pages is to furnish a collection of recipes for the brewing of compound drinks, technically called “Cups”, all of which have been selected with the most scrupulous attention to the rules of gastronomy, and their virtues tested and approved by repeated trials. These we are inclined to put into type, from a belief that, if they were more generally adopted, it would be the means of getting rid of a great deal of that stereotyped drinking which at present hold sway at the festive boards of England. In doing this, we have endeavored to simplify the matter as much as possible, adding such hints and remarks as may prove serviceable to the uninitiated, whilst we have discarded a goodly number of modern compounds as unpalatable and unscientific. As, in this age of progress, most things are raised to the position of a science, we see no reason why Bacchanology, if the term please our readers, should not hold a respectable place, and be entitled to its due mead of praise; so, by way of introduction, we have ventured to take a cursory glance at the customs which have been attached to drinking from the earliest periods to the present time. This, however, we set forth as no elaborate history, but only as an arrangement of such scraps as have from time to time fallen in our way, and have helped us to form ideas of the social manners of bygone times. 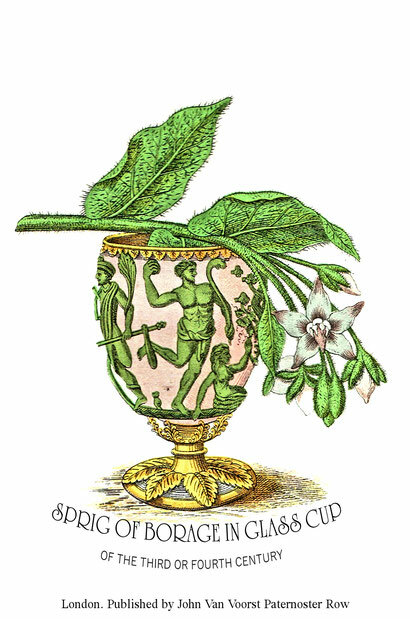 We have selected a sprig of Borage for our frontispiece, by reason of the usefulness of that pleasant herb in the flavoring of cups. Elsewhere than in England, plants for flavouring are accounted of rare virtue. So much are they esteemed in the East, that an anti-Brahminical writer, showing the worthlessness of Hindu superstitions, says, “They command you to cut down a living and sweet basil-plant, that you may crown a lifeless stone.” Our use of flavoring-herbs is the reverse of this justly condemned one; for we crop them that hearts may be warmed and life lengthened. The golden times, the age of gold! To go with temperance even-handed. We’ve got the paper age instead! without the least jealous feeling being aroused at the employment of a Muse whose labors ought to be secured solely for humanity; but a cup-drink, little and good, will, for its social and moral qualities, ever hold the chief place in our likings. THE Second Edition of this book contains much additional matter, all of which has been derived from notes collected by one of the original author of the work, whose untimely death is mourned, and whose genial hospitality is remembered, by very many friends. The compiler believes that the additions made will greatly increase the usefulness of the book to all compounders of Cups. In more modern times, the middle ages for example, we find historic illustration of a new use of the word, where Skoll was applied in another though allied sense. Thus it is said of one of the leaders in the Gowryan conspiracy “that he did drink his skoll to my Lord Duke”, meaning that the health of that nobleman was pledged; and again, at a festive table, we read that the scoll passed about; and, as a still better illustration, Calderwood says that drinking the king’s skole meant the drinking of his cup in honor of him, which, he adds, should always be drank standing. In more modern times, however, drinking-cups have been formed of various materials, all of which have, at least in regard to idea, a preferable and more humane foundation than the one from which we derive the term. Thus, for many centuries past, gold and silver vessels of every form and pattern have been introduced, either with or without lids, and with or without handles. HANAP is the name of a small drinking-cup of the 15th and 16th centuries, made usually of silver, gilt, standing upon feet. They were made at Augsburg and Nuremberg. In an old French translation of Genesis, we find at v. 5, c. xliv. :- “Le Hanap que vous avez amblèe est le Hanap mon Seignor, et quel il solort delete, male chose avez fait”, relating to the silver cup Joseph ordered to be put in his brother’s sack. In some Scotch songs a drinking-cup is called cogne or cog: this word is also spelt in different parts of Scotland cogie, and coig. This word may be compared with coculum (medical Latin for a hollow wooden vessel), also with the old German kouch, and the Welsh cawg, a basin. The Flemish drinking-cups of the 16th and 17th centuries were called vidricomes, i. e. “come-agains”. The bell-shaped drinking-glasses of the sixteenth century are specially worthy of observation; and there are three very good specimens in the Bernal Collection at the South-Kensington Museum, one of which is said to be German, and the others Venetian. The mounting of the German glass consists of a hollow sphere in silver, which encloses a dice and is surmounted by a small statuette of Fortune. To the mounting of another of these glasses is attached a little bell. These glasses will stand in the reversed position only, and were of course intended to be emptied at one draught, the dice being shaken or the bell tinkled as a finale to the proceeding. There is also a curious cup in the possession of the Vintners’ Company, representing a milk-maid carrying a pail on her head. This pail is set on a swivel, and is so contrived that the uninitiated, when attempting to drink, invariably receive its contents on their neck or chest. In the last century it was very fashionable to convert the egg of the ostrich or the polished shell of the cocoa-nut, set in silver, into a drinking-vessel. Many varieties of tankards were formerly in use, among which we may mention the Peg-tankard and the Whistle-tankard, the latter of which was constructed with a whistle attached to the brim, which could be sounded when the cup required replenishing (from which, in all probability, originated the saying, “If you want more, you must whistle for it”); or, in more rare instances, the whistle was so ingeniously contrived at the bottom of the vessel that it would sound its own note when the tankard was empty. The Peg-tankard was an ordinary-shaped mug, having in the inside a row of eight pins, one above another, from top to bottom: this tankard held two quarts, so that there was a gill of ale, i. e. half a pint, Winchester measure, between each pin. The first person who drank was to empty the tankard to the first peg or pin, the second was to empty to the next pin, and so on; the pins were therefore so many measures to the compotators, making them all drink alike; and as the space between each pin was such as to contain a large draught of liquor, the company would be very liable by this method to get drunk, especially when, if they drank short of the pin, or beyond it, they were obliged to drink again. For this reason, in Archbishop Anselm’s Canons, made in the Council in London in 1102, priests are enjoined not to go to drinking-bouts, nor to drink to pegs. This shows the antiquity of the invention, which, at least, is as old as the Conquest. There is a cup now in the possession of Henry Howard, Esq., of Corby Castle, which is said to have belonged to Thomas à Becket. It is made of ivory, set in gold, with an inscription round the edge of it, “Drink thy wine with joy”; and on the lid are engraved the words “Sobrii estote”, with the initials T. B. interlaced with a mitre, from which circumstance it is attributed to Thomas à Becket, but in reality is a work of the 16th century. Mr. Milner, in ‘Archeologia’, vol. xi. p. 411, describes a maple-wood tankard, belonging to Lord Arundel, as of Saxon workmanship coeval with Edgar, A.D. 800, who also passed a law, on the suggestion of St. Dunstan, to prevent excessive drinking, by ordering cups to be marked into spaces by pegs, that the quantity taken might be limited. A considerable number of these ancient maple-wood tankards also exist in the Museum at the Castle of Rosenburg. They were formerly made by the Norwegian peasants during the long winter nights; and their style of ornament cannot be older than the 16th century. Contemporaneous with mazer-bowls were others called Piggins, Naggins, Whiskins, Kannes, Pottles, Jakkes, Pronnet-cups and Beakers. Silver bowls were next introduced; and about the latter end of Elizabeth’s reign these were superseded, as wine grew dearer and men were temperate, by glasses. The earliest glasses used at banquets were Venetian and no mention is made of glasses at state banquets before the time of Elizabeth. In the latter half of the last century, beer was usually carried from the cellar to the table in large tankards made of leather, called Blackjacks, some of which are still to be found, as also smaller ones more refined in their workmanship, and having either an entire lining of silver, or a rim of silver to drink from, on which it was customary to inscribe the name of the owner, together with his trade or occupation. “Tygs” were two-handled drinking-cups of the time of Elizabeth, rudely formed of Staffordshire fire-clay called “Tyg”. At the end of the last century, glasses were manufactured of a taper form, like a tall champagne-glass, but not less than between two and three feet in height, from which it was considered a great feat to drain the contents, generally consisting of strong ale, without removing the glass from the lips, and without spilling any of the liquor, - a somewhat difficult task towards the conclusion, on account of the distance the liquid had to pass along the glass before reaching its receptacle. The earliest record we have of wine is in the Book of Genesis, where we are told, “Noah began to be an husbandman, and he planted a vineyard”, from which it is evident he knew the use that might be made of the fruit by pressing the juice from it and preserving it; he was, however, deceived in its strength by its sweetness; for, we are told, “he drank of the wine, and was drunken”. When the offspring of Noah dispersed into the different countries of the world, they carried the vine with them, and taught the use which might be made of it. Asia was the first country to which the gift was imparted; and thence it quickly spread to Europe and Africa, as we learn from the Iliad of Homer; from which book we also learn that, at the time of the Trojan War, part of the commerce consisted in the freight of wines. In order to arrive at customs and historical evidence less remote, we must take refuge, as historians have done before us, in the inner life of the two great empires of Greece and Rome, among whom we find the ceremonies attached to drinking were by no means sparse; and as the Romans copied most of their social manners from the Greeks, the formalities observed among the two nations in drinking differ but little. In public assemblies the wine-cup was never raised to the lips without previously invoking a blessing from a supposed good deity, from which custom it is probable that the grace-cup of later days took its origin; and at the conclusion of their fest, a cup was quaffed to their good genius, termed “poculum boni Dei”, which corresponds in the present day with the “coup d’étrier” of the French, the “dock un dorish” of the Highland Scotch, and the “parting-pot” of our own country. The Romans also frequently drank the healths of their Emperors; and among other toasts they seldom forgot “absent friends”, though we have no record of their drinking to “all friends round St. Peter’s”. It was customary at their entertainments to elect, by throwing the dice, a person termed “arbiter bibendi”, to act much in the same way as our modern toast-master, his business being to lay down to the company the rules to be observed in drinking, with the power to punish such as did not conform to them. The gods having been propitiated, the master of the feast drank his first cup to the most distinguished guest, and then handed a full cup to him, in which he acknowledged the compliment; the cup was then passed round by the company, invariably from left to right, and always presented with the right hand; on some occasions each person had his own cup, which a servant replenished as soon as it was emptied, as described in the feast of Homer’s heroes. The vessels from which they drank were generally made of wood, decorated with gold and silver, and crowned with garlands, as also were their heads, particular flowers and herbs being selected, which were supposed to keep all noxious vapors from the brain. In some cases their cups were formed entirely of gold, silver, or bronze. A beautiful example of a bronze cup was found in Wiltshire, having the names of five Roman towns as an inscription, and richly decorated with scenes of the chase, from which it has been imagined that it belonged to a club or society of persons, probably hunters, and may have been one of their prizes; they also used cups made from the horns of animals. The wines were commonly drunk out of small glasses called “cyaths”, which held just the twelfth of a pint. The chief beverage among the Greeks and Romans was the fermented juice of grape; but the particular form of it is a matter of some uncertainty. The “vinum Almabum” was probably a kind of Frontignac, and of all wines was most esteemed by the Romans, - though Horace speaks in such glowing terms of Falernian, which was a strong and rough wine, and was not fit for drinking till it had been kept ten years; and even then it was customary to mix honey with it to soften it. Homer speaks of a famous wine of Maronea in Thrace, which would bear mixing with twenty times the quantity of water, although it was a common practice among the natives to drink it in its pure state. Salt water was commonly used by the Romans to dilute their wine, which they considered improved its flavor, having previously boiled it. This custom is said to have originated in the efforts of a slave to prevent detection, who, having robbed his master’s wine-cask, filled it up with salt water. The Romans also mixed with their wine asafetida, tar, myrrh, aloes, pepper, spikenard, poppies, wormwood, cassia, milk, chalk, bitter almonds, and cypress; and they also exposed their wines to the action of smoke in a sort of kiln, which thickened and matured it. These mixed wines were taken in a peculiar kind of vessel called a “murrhine cup”, which was said to impart a peculiar flavor to them; and though the substance of which these cups were made is not known, it is fair to surmise they were made of some aromatic wood similar to the “bitter cup” of the present day, which is made from the wood of quassia tree.